This delicious and decadent dish has roughly half the carbon footprint of a traditional recipe, and it is so full of flavor you won’t miss anything! It uses summer produce and practically makes itself! It’s amazingly simple–you just throw some roughly chopped veggies into a pan with a small amount of water and crank up the heat. As the veggies stew, the whole mixture turns into a soup! You just need to blend it up, add some spices, and enjoy! This delicious and decadent dish has roughly half the carbon footprint of a traditional recipe, and it is so full of flavor you won’t miss anything! It uses summer produce and practically makes itself! It’s amazingly simple--you just throw some roughly chopped veggies into a pan with a small amount of water and crank up the heat. As the veggies stew, the whole mixture turns into a soup! You just need to blend it up, add some spices, and enjoy! Cut the corn tortillas into ¼ inch thick strips. Spread them out on a baking sheet (it works best if you have parchment paper). Bake for 20 minutes or so. You may want to push them around on the sheet part way through to get even baking. Place everything from the halved or quartered tomatoes through the cilantro springs into a large saucepan with 1 cup water. Bring to boil, and then reduce heat to medium and cover. You can stir this occasionally over the next 20 to 30 minutes. Pull out the cilantro sprigs and chipotle chilis if you used them, and discard. Immersion blend your soup, or you can let it cool a bit and transfer in batches to your blender and then back into the pan. Add the smoked paprika and chili powder. Add salt to taste. Add a bit (say ½ cup of water), and simmer for another five minutes or so. 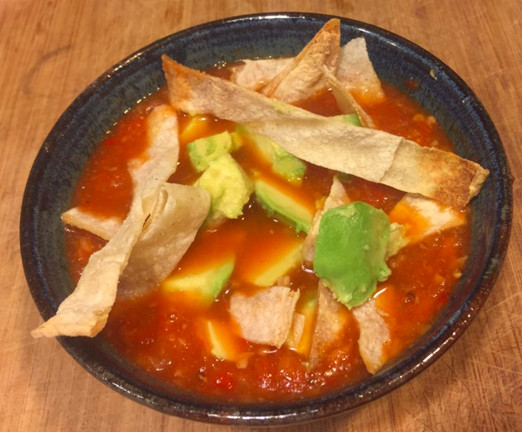 Serve with some of the following toppings: scallions or chopped white or red onion, avocado, tortilla strips, chopped tomatoes, and/or cilantro. This recipe is a big hit for our family dinners, and it is special enough to serve at a dinner party. We make a topping bar, and each person can make his or her own creation. I’ve modified (simplified) this recipe from the original, which is from Forks Over Knives. I am a big fan of so many of their recipes. You can find the original recipe here, and you can buy their cookbook here. 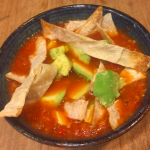 The chicken you might add to a traditional tortilla soup has a carbon footprint of 1146 g CO2-equivalents, which is more than the entire soup made the way presented here. The mushrooms add taste and body, have lots of great nutrients, and contribute very little to the carbon footprint. For this recipe, there aren’t enough mushrooms to make this a high protein meal; however, per calorie, crimini mushrooms are actually pretty high in protein! And, if you would like to amp up the protein, you can add black beans as a topping. 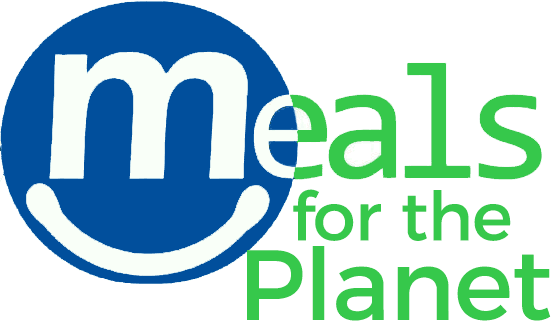 If you make this, please post on our Facebook page, or instagram using the hashtag #easymealsfortheplanet so we can see what you made! Hard to believe how somple this is and how good it tastes. But don’t think you can make it work without the toppings. You can’t — and still expect it work. They’re easy but essential!